Barbecue — along with jazz, abstract expressionism, and ripping a hanging curveball down the left field line — is one of the greatest American art forms. 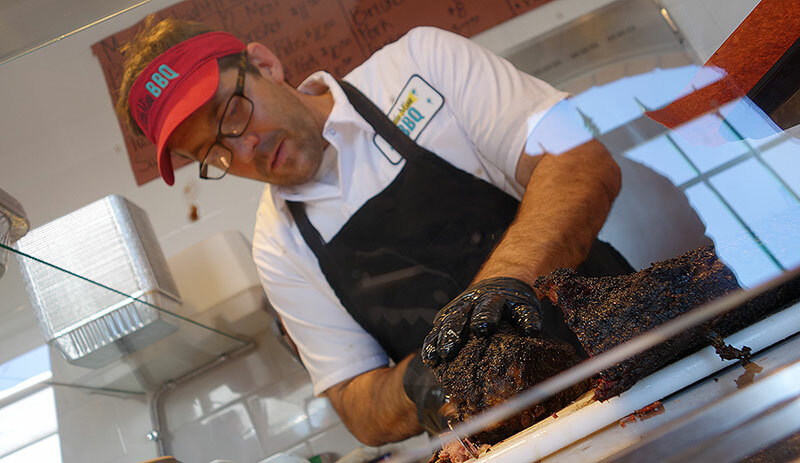 Though styles and methods differ from place to place, one of the most iconic versions is Texas-style beef brisket, and much to Phoenix’s delight, the brisket at the recently opened Little Miss BBQ is way better than any brisket served outside of Texas has a right to be. Okay, okay, “barbecue” is a word that encompasses a whole lot of styles the world over. But for the purposes of this discussion, we’re talking about American barbecue. And we’re not talking about barbecue in the sense that many will refer to anything tossed on the grill and slathered in smoky ketchup as barbecue. No, we’re talking about the meaty pride of the American South, animal protein that’s transformed by wood smoke, cooked low and slow until smoky and tender. And in this instance, we’re talking about a style of barbecue native not just to Texas, but specifically to central Texas, where beef is king, sausage plays a beloved supporting role, and sauce is often treated with suspicion if not outright contempt. The historical roots of central Texas barbecue go deep and wide, spreading out to Spain, the Caribbean, and Germany, and reaching back millennia, to the meat preservation techniques of the local Caddo Indians. But its modern form coalesced in the 19th century, when local barbecue traditions met those of migrant cotton farmers moving west, an influx of German and Czech immigrants brought sausages and butcher shop smokehouses, and the burgeoning ranching industry caused an explosion in the popularity of beef. Over time, makeshift shacks and roadside stands serving itinerant workers evolved into formal restaurants, modern health codes brought the meat out of roadside pits and into brick and metal smokers, and widespread community barbecue festivals gave rise to the competitive barbecue circuit. Today, the smoked brisket and sausage of towns like Taylor, Luling, and Lockhart, sliced to order and served on butcher paper, have earned a kind of cult-like reverence that has extended far beyond Texas’ borders, thanks in no small part to the efforts of the barbecue-obsessed, like Scott Holmes. When Holmes, a Phoenix native, married into a central Texas family, he didn’t realize that he was also marrying into a career change. He attended culinary school and had worked for a time in the restaurant industry before leaving it behind. But during a visit to his in-laws, he took the opportunity to sample some Texas barbecue, and it sparked an obsession that started with a backyard smoker, grew into to a competitive barbecue team, and led him back to the culinary field with the opening of Little Miss BBQ, an already wildly popular Phoenix restaurant where Scott, his wife Bekke, and longtime friend Travis serve up the kind of food that grabbed a hold of him on that first trip. Even beyond the food, Scott was taken by the incredible vibe of those ancient Texas pits, and while that isn’t something you replicate without the genuine clientele and decades of smoke working its way into every crevice, the trio have embraced the tradition of keeping the focus on the meat, serving it up in stripped-down, casual surroundings, and making the quality of the ‘cue the top priority, even if that means sometimes selling out a couple of hours after opening the doors. And while everything served up at Little Miss is great, the brisket is threatening to steal the show. It starts with this — beef brisket — a cut taken from lower part of the cow’s chest, just above the front legs. With the ribs and deckle (which connects the brisket to the ribs) removed, as you see here, a brisket is comprised of two parts, roughly equal in size. On the near side, the “point,” the thicker and fattier part of the brisket, heavily marbled with collagen and other connective tissue. On the far side, the “flat,” which is thinner and leaner than the point. 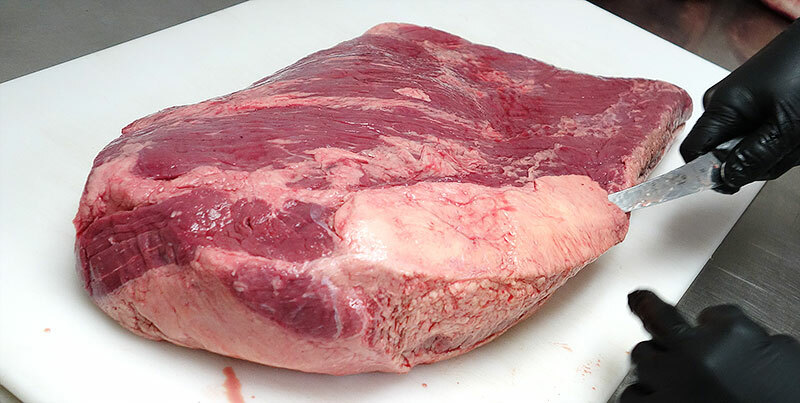 The chest muscles that compose the brisket are some of the animal’s primary weight-bearing muscles, and that heavy workload makes the brisket a cut that’s both very tough, and very flavorful. While volumes can be (and have been) written about the science behind transforming a tough hunk of meat into smoky, tender bliss, there are two key processes at work. The first is the transformation of collagen into gelatin. Tougher cuts of meat, like brisket, tend to have more connective tissue, and if that connective tissue doesn’t break down, it stays tough and chewy. But at around 160°F, the collagen that comprises most of the connective tissue in a brisket starts to convert to gelatin, and given enough time, it will melt into the juicy, silky, tender stuff that makes a beautiful cut of slow-cooked meat without shedding so much moisture that the meat becomes tough and dry. The second process is the introduction of smoke. Wood smoke is packed with nitrogen dioxide, which mixes with water on the surface of the meat to create nitric acid, which in turn is pulled into the meat and binds with myoglobin in the muscle fibers, lending a smoky flavor and the telltale pink smoke ring. The trick with barbecue, as with any chemical process, is controlling and adjusting to variables — the fattiness and shape of the meat, the amount of smoke, the precise temperature in the smoker, the amount of time it cooks, and a horde of other tiny details that all add up to create the unique character of the finished product. It’s the reason barbecue is one of the most difficult foods to make in a consistent manner, and the reason that arguing over the finer points of what does and doesn’t make great ‘cue is something of a national obsession. Prep on Little Miss BBQ’s brisket starts late at night two days before it will be served, when it’s first trimmed, removing some of the fat cap, leaving enough to baste the meat as it melts, and exposing certain parts of the muscle for better smoke absorption. It gets a simple dry rub of salt, pepper, garlic powder, and a little bit of cayenne, and it’s wrapped and refrigerated overnight to draw out some surface moisture and let the flavors of the rub work their way into the meat. 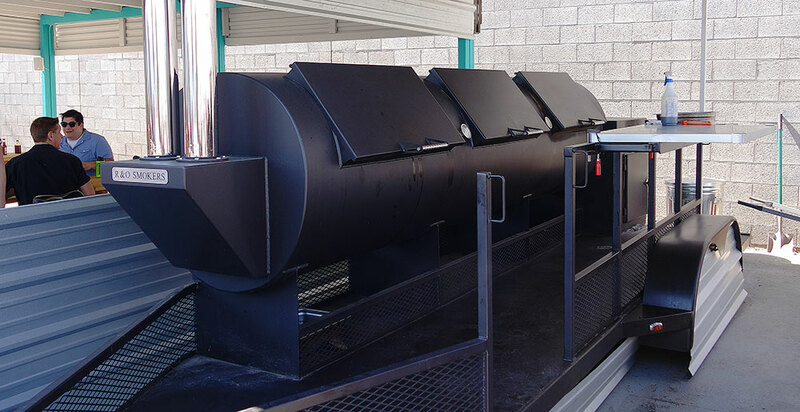 The actual cooking process starts the morning of the day before it will be served, when the crew fires up the smoke box with oak, brings the temperature of the smoker up to 250°F, and gives the brisket just a little bit more dry rub before it’s loaded in. At this point, cooking the brisket becomes a waiting game, carefully watching the heat and the amount of smoke and adjusting the vents and fire as necessary. Within a couple of hours, the surface of the brisket has dried out and the outer bark has started to develop. But just a few hours after that, the brisket starts weeping uncontrollably, oozing from every pore, little pools of juice and fat collecting on top of the meat. 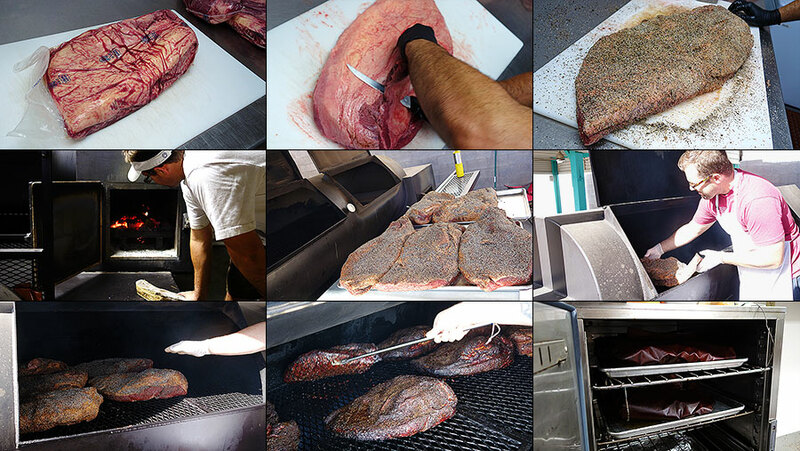 To maintain the flavor and texture of the bark, the crew tends the briskets, either mopping up pooling juices or tipping the briskets with a metal rod to drain any excess moisture collecting on top. By late afternoon, the meat has absorbed as much smoke as Holmes wants (“Smoke is an ingredient like any other — you can add too much.”), and the briskets are wrapped in butcher paper and returned to the smoker, so that the collagen can continue to break down and the bark can maintain the tender, moist character that he’s looking for. Late that night, whenever the brisket decides it’s ready (it’s really the brisket who’s in charge, here) and it reaches its final cooking temperature, it is removed from the smoker. By now, the bright orange paper has become soaked with the beef’s juices and fat, and has turned a deep umber color. For a short while, the paper-wrapped brisket has a powerful aroma that smells, oddly enough, exactly like hot cocoa. But this dissipates as the brisket is left to rest at a gentle, warm temperature for a few hours until the shop opens in the morning, at which point it’s ready to serve. Little Miss BBQ is only two months old, but already the line starts forming early, sometimes up to half an hour before the 11:00 opening time. Waiting next to the smoker as those who arrived before you go walking by with plates piled high with meat is borderline torturous. Once through the door, Scott meets you with a smile and a counter piled with brisket, which he’ll slice to order — fatty or lean — and weigh out before sending you down to the register. And finally, about 36 hours after the meat was first trimmed, the finished product is there in front of you, its intoxicating, smoky scent pulling you in. 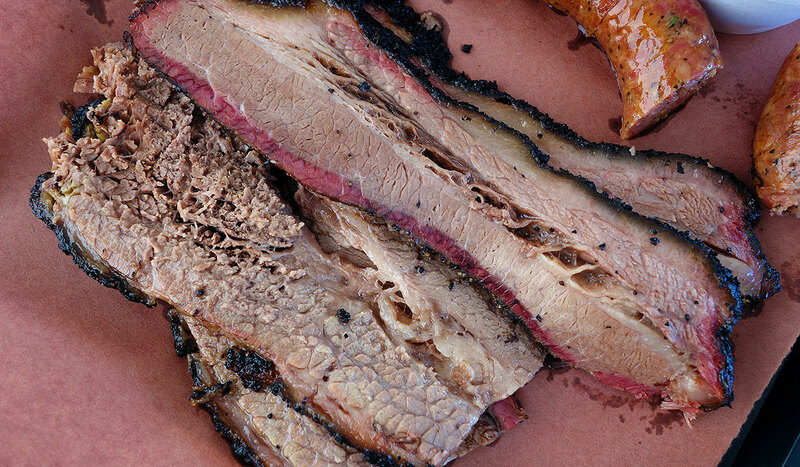 The lean (flat), shown here on the top right, is for those who like their brisket to have a little bit of resistance. Though tender, it has a light chewiness, and the fat is mostly limited to a thin layer of the cap, and perhaps a vein running through the center. The fatty brisket (point), however, is like meltaway meat, laced throughout with luscious, silky fat and gelatin, its pure, beefy intensity enrobed in a mellow but pronounced smokiness, enough to evoke the oak but not so much that it overpowers the meat or gets bitter. And the bark, peppery and intense, has a deep, developed spicy complexity. The sauce? All three varieties — regular, spicy, and mustard — are excellent, not overly sweet, and perfectly spiced with a light, vinegary tang. But as with any Texas brisket worth its salt, you don’t need it. The meat stands on its own. Little Miss BBQ is located at 4301 East University Drive in Phoenix, tucked into an industrial area west of the 143, just southeast of the airport. Best to get there at least 15 minutes before the 11:00 opening, otherwise you run the risk of a long wait or the brisket running out before you get to the counter. The sausage, made in-house, juicy and spiked with jalapeño, is a perfect porky pair to the brisket, but all of the meats are delicious, as are the beans, full of flavor and cooked with — natch — lots of chopped meat. And if you’re interested in the process, talk to Scott’s dad, who’s usually tending the smoker during the day. He’s full of pride, both for the new family business and the gargantuan smoker, and he’s all too happy to show it off to anybody who’d like to see. This entry was tagged barbecue, BBQ, beef, brisket, meat, smoked. Bookmark the permalink. So glad you got me here but I cannot stop thinking about it. My buddy Brian LaFrance is a big BBQ guy & was super complimentary of them so I’d been wanting to go since they opened. Now I just can’t believe I waited so long. I pretty much want to go back every day. I want fatty brisket, lean brisket and short rib bad. I was shocked at how great the turkey was too. I think the only thing I’ve missed other than the daily specials is the pulled pork. Need to get on that with the mustard sauce as you recommended. I used to work in the dreary industrial neighborhood where Little Miss is located. I didn’t miss it all until I started reading about the ‘cue. If you mean that the best barbecue is often found in the least appealing parts of town, then I agree completely. It’s been that way most places where I’ve lived. It’s just that until Little Miss opened there was no barbecue to redeem the area — although the La Canasta Burrito Shoppe, which previously occupied the space and has moved just a few blocks away, is pretty good. Dom, I do like your new blog. Thanks for posting it on the SD news feed. Best, Anon Man.